Share this product and receive a $1.00 sharing discount. Beat the heat this summer! 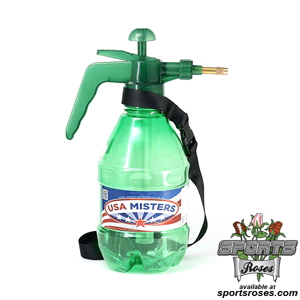 Our portable misters are the perfect way to stay cool at summer tournaments and events. The extra large capacity (40 oz) bottle will keep you cool during those long games. The bottle also features a wide mouth that allows you to add ice and give your mist an extra chill. The high quality solid brass nozzle is fully adjustable. Set it to a fine cooling mist for important relief from 100+ degree temperatures. Or the kids will love setting it to jet stream for fun water gun fights in the backyard. Also included is a FREE lanyard to make it easy to carry your mister with you on long walks or hikes. The High Capacity Personal Mister XL will be your best friend at all summer events when the temperatures rise above 90 degrees. 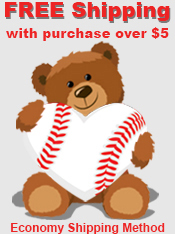 Make sure to keep your personal mister with you at softball tournaments, baseball tournaments, concerts, racing events, swap meets, fairs, camping, hiking, picnics, barbeques, fishing, and outdoor sporting events. Available in 5 assorted colors: BLUE, RED, GREEN, PURPLE, AND PINK. From Anonymous of Huntington Beach, California on 7/18/2017 . Great product. Used it at a softball tournament in Lancaster. Helped to keep the girls cooled . . .
All Sports Roses are handmade to order in our San Diego Workshop. © L.O.V.E.nterprises. Baseball Rose, Softball Rose, Football Rose, and Sports Roses are trademarks of L.O.V.E.nterprises. All Rights Reserved.